Do your research – when booking places to stay make sure they have secure parking, or, if they don’t, ask reception if you can park your bike in front of the main entry. Picking a well-lit, high traffic and high visibility place to leave your bike overnight will deter thieves. Make sure you invest in insurance – road insurance is obviously a must when riding your bike abroad, but you should ensure you are covered against theft whilst abroad. You should also invest in specialist motorcycle travel insurance, which will cover the costs and effect on your holiday, should your bike be taken. Invest in an alarm – budgets are usually tight when it comes to touring, but a motorcycle alarm is a great investment and may even save you money on your bike insurance. A good model will have a motion sensor which will message you if your bike is approached or moved. Use multiple locks – try to diversify and multiply the locks and cables you use to protect your bike. Always ensure you secure your motorcycle against a stationary object if at all possible – e.g. a pole or bollard. Potential thieves should then take one look at your bike and immediately be deterred by the level of challenge breaking all those locks and cables presents. 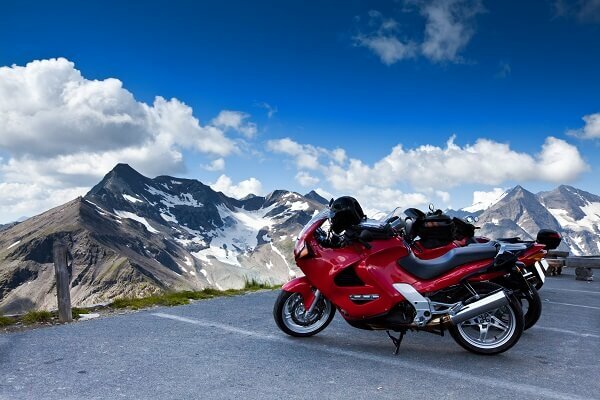 Visit Holidaysafe.co.uk for more biker travel tips and for a free motorcycle travel insurance quotation.